Reader Question: How To Treat A Cat That Has Irritation and Hair Loss Between Its Shoulder Blades? Vet has not been able to diagnose this. I'm asking for any help. My 4 year old spayed cat is otherwise healthy. Passed all tests at my vet. I adopted her from a shelter. This area of hair loss and irritation grew within a few days after I got her. Medication was applied by the shelter in this spot between her shoulder blades. Small area of similar irritation under left eye appeared at the same time. She eats, drinks, plays, but this still bothers her. This is the best photo I could get. You have my gratitude. I am unable to give you a definitive answer as to what might be going on with your cat’s skin without first examining her, but your comment that medication was applied to this area while she was at the shelter could certainly be relevant. I suspect this medication was for parasite treatment/prevention, and some cats develop abnormal skin irritation and hair loss in response to contact with these products. If this is the case, everything should return to normal over the next few weeks, though it will take longer for the hair to completely regrow and sometimes it comes back in a different color. It certainly wouldn't hurt to wash the area between the shoulder blades with a gentle soap, rinse it well, and call the shelter to ask what they used so you can be sure to avoid that product in the future. 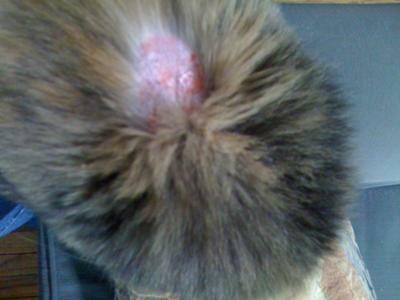 If, however, the skin lesions get worse rather than better with time, make an appointment with your veterinarian. Cats that have been housed in a group setting are at higher than average risk for problems like ringworm and some types of mange. My cat has a similar condition (not sure if it is the same thing but I have seen bald spots like the picture you posted only not as big). Sometimes he gets bald spots and sometimes cuts/irritations around the neck/throat. The vet diagnosed him with linear granuloma (also eosinophilic granuloma complex) (EGC) which is the same type of thing. By the way if you research it, the pictures will look far worse than what your cat has. My vet said it is called linear because the cuts are usually formed in a line. I have seen both cuts in a line and in round patches on my cat. Usually they are around his neck and at first I took off his collar because I thought that was the problem. The vet did mention that the condition does go away and come back several weeks later. I don't know if I agree with how he explained it but he said that the cat's body is being tricked and it thinks that a parasite is trying to get into the body so all of the cells (antibodies or whatever is in their body that would help - I don't remember what exactly) rush to the spot on the skin to try to push the parasite out and keep it from coming in (even though there is no parasite). That is how the cuts/irritations are formed. Sometimes he also gets a bald spot on the skin around the neck with no cut there at all. If I look closely I can sometimes see tiny black dots there. The vet gave us prednisone (a steroid) and said he should get half a pill twice a day. When the cuts go away, he can have half a pill once a day, then half a pill every other day and then finally no pills. He also gave us a cream to put on the cuts called Mometasone Furoate, USP Ointment 0.1%. The cream and the prednisone worked well but after he came off the prednisone the cuts came back several weeks later. The vet said it is really tricky to treat and might be ongoing. We put him back on the prednisone twice daily because he got a really big round cut/scab in the middle of his back. We also put the cream on it but he tried to lick it off so we can't use it or have to put a cone on his neck. It doesn't seem to be getting better so we will have to take him back to the vet. 1. Sit behind the cat and trap him between your legs. 2. Hold his head up and pry his mouth open by sticking your thumb and pointer fingers by where his big front teeth are. 3. Drop the pill down and hold the mouth closed. 4. Use a syringe filled with water and stick the tip of the syringe under the side of his lips. Slowly push the water into his mouth so he is forced to begin swallowing. Do it slowly so he doesn't choke. Doing it from the side of the mouth makes it more comfortable for him rather than shoving it down the front. I have tried every thing. Vet thought food allergies, liter allergies, fleas..poor thing she was taking some kind of a monthly pill plus the monthly liquid flea application. She had huge crusts all over her body and would chew herself down to the bone. Her her would be gone. I was done with the vets. Started looking natural healing. Discovered she had ringworm. Ringworm is not caused by a worm. It is a fungal infection. What has worked like a miracle is Apple cider vinegar mixed with water. 1 tablespoon Apple cider vinegar to 1 cup warm water. I saturated the areas affected but not the ones with open wounds. I do that several times a day. Good news sores have healed, hair is growing back and she is no longer naming at her legs or stomach or pulling out chunks of hair. It was the easiest and safest way to cure her fungal infection. You can also increase the amount of vinegar to even equal parts water to vinegar. Just remember to used the Apple cider. This mixture is also a great flea medication. I noticed a flea dead...even after all that damn flea meds she takes. The vinegar killed the flea. Hope this helps your kitties out.